Today I canned some peaches. It will most likely be the last time I can get fresh peaches directly from a farmers' market so I thought I should take advantage while they were still available. I always can the peaches in white grape juice, the sugar content is so much less than traditional simple syrup mixtures used for canning fruits. And my daughter loves them as much as I do so it's nice to have someone to share them with so I don't end up with too many jars. I have learned to can the peaches in the small jars. I used to use the pint jars and I would have to each peaches every day for a week to finish them all up or risk having them spoil once opened. With these half-pint jars I am relieved of that stress - ha! 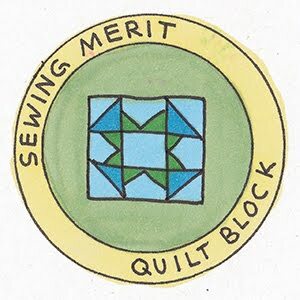 I completed the Piece Out quilt from the Missouri Star Quilt Co. Block Idea Book - Fall Vol.3 Issue 5. The pattern requires a jelly roll and some yardage for the background and borders. Since it's made from jelly roll strips, this goes together rather quickly. I grabbed a fall jelly roll from my stash. I purchased it last September at the Madison Quilt Expo so it spent a lot of time just hanging out on my shelf. It was time to use it up. I did have a little hiccup; the half square triangles get sewn to the upper left corner of each block and during my chain piecing, I accidentally turned a group of blocks the wrong way and sewed the half square triangles on the wrong corner. I realized it a bit too late - after I trimmed away the corners. I ended up having to re-do only two of the squares to finish the quilt top. Phew! That was a close call. The final result is a warm, fall quilt just in time for the sew season. The funny thing is that the weather here in southeastern Wisconsin is unusual right now. It's been over 90 degrees every day for about a week now. That makes it difficult to think about fall at all. This is Bendy, a cartoon character from a show called Bendy and the Ink Machine. My granddaughter, Chloe just loves the characters from the show. She watches YouTube videos with Bendy in them all the time. Last week Chloe asked me if I could make a Bendy plushie. I said sure. I say yes to pretty much everything she asks for that is not harmful (and so far I don't think Bendy is terribly harmful). He's a little creepy but she generally likes those kinds of things. She also likes the big dinosaurs in Jurassic World and all the Pokemon characters. I took this image of bendy and thought I would start from there. 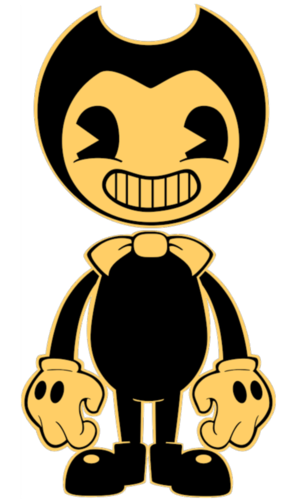 I asked Chloe about the colors and she told me that Bendy is really black and white but this version is more yellowish because there's now a video game with Bendy and he shows up in the game in these colors. She would prefer her plushie was in black and white as she explained that those are his original colors. So I found another image that would be easy to use as a pattern. I took the image and enlarged it to where it would be a nice size for a pattern and cut it out. The hard part was going to be figuring out how to get the details created. I wanted to just copy the entire image onto a piece of fabric, cut it out and stuff it but that would require lots of expensive printer ink and it wouldn't be very personal. I just did not want to do any hand embroidery. I decided that felt and machine stitches would be a great way to get it done within a reasonable amount of time. It's not that I'm against spending lots of time on making things for my granddaughter, it's that I don't like spending time on things that she will probably decide she doesn't care about anymore in about a month. Chloe is only 7 and her likes and dislikes change pretty regularly. I think my cheesy replica will do for now. And if she is still enamored with this character at Christmastime, I just might make a bigger, better version. I finished a few more fall table runners today. I would have completed them earlier however I ran out fall prints big enough for backing. Over the weekend I picked up a few new fall fun prints to complete a few more little projects. I made one of the table runners using the leftover scraps from my Skip to my Lou quilt I made last year. I also dug up some vintage floral/pumpkin print from my stash and added some borders left over from last year's quilt project as well. I like having a variety of sizes of runners available for sale at craft fairs and these should be good additions to my inventory. The patchwork runner is 18 inches x 20.5 inches and the fall floral one measures 48 inches x 16.5 inches. I did it! I finally finished my Tula Pink's City Sampler Quilt. Her book, 100 Modern Quilt Blocks was definitely put to use. I did realize that I only made 98 blocks when I discovered I had unintentionally repeated 2. So I went back and made the missing 2. 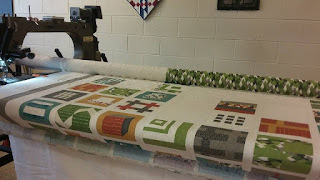 I think my quilt should be called the 102 City Sampler blocks - ha! I won the fabric collection I used for this quilt top. All I had to do was add the few yards of Kona Ivory for the background. That is until I got to the backing. There was hardly anything left but a little pile of scraps so Jeff and I took a day trip up to Bungalow Quilting and Yarn in Ripon, WI where I won the fabric. I bought about 5 yards of matching fabric to piece the back and make the binding. Not a bad investment and what a fun day trip. It is always wonderful to talk to Judy Gauthier, the shop owner. Being in her presence is refreshing as she is so bubbly and sweet. I would have finished this quilt sooner, but I really wanted to put it on a longarmer. The problem is that since I do not own one, I had to buy time on one. So I joined the local senior center where they have a Gammill. I got my name on the list and waited for my turn to come. It was late August when I got the call that September 14th was the first available date. Wow! That's a long time but I was willing to wait. So yesterday I got to use the Gammill for the very first time. It was a lot of fun even though I was quite nervous at the start. I was so afraid of screwing up the quilt, but I reminded myself that I did use a smaller longarm quilter already so it should be no big deal. The ladies who volunteer at the senior center were so very nice and knowledgeable that it was very easy to quilt this extremely large quilt. They did all the setup. 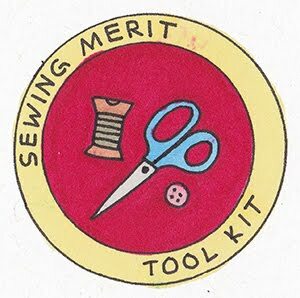 They wound the bobbins with my thread choice, they loaded the backing, batting and quilt top onto the rollers and set up the pantograph. All I had to do was run the machine. Easy peasy. The whole process took less than 3 hours and cost me $59. When I got home I was exhausted. I wanted to attach the binding but I was just too tired. So I relaxed for a few hours then got up the energy to make and sew the binding to the back of the quilt. Today I finished the part where I folded the binding to the front and stitched it down. I was a little concerned about the thread. The only match I had was a new spool of Gutermann. 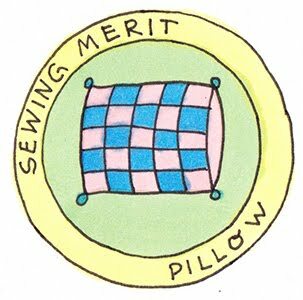 There's not much thread on those little spools and this quilt is a monster. With a decorative stitch on the binding, I knew it might be close. With a wish and some luck, the binding went on with almost no thread left. What a close call! I am so very happy that this quilt is finished. It's been quite a journey from start to finish. I feel I stepped out of my comfort zone with this fabric collection. It is called Adventures by Amy Ellis. The colors and patterns are beautiful but I don't think I would choose them on my own. And the City Sampler was quite an accomplishment. 100 different blocks. The cool thing is that after making all of them I know I will use some of these blocks again in another project. Early in the project when some of the blocks were hanging on my design wall my son would walk by the room and ask what they were going to be used for. He really like the color combinations. How perfect...he just bought a house on Lake Winnebago so guess what he's getting for a housewarming gift? Ha! I went on a bus trip to the Madison Quilt Expo yesterday. 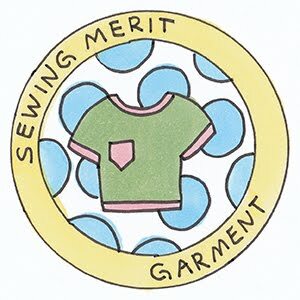 My plan for the day was to test drive longarm sewing machines. I did set aside some funds just in case I found any great fabrics, but I didn't really plan on purchasing anything. I don't know why I even think that I won't buy fabrics. With the many fine fabric shops represented at the expo I cannot resist. I found so many pretty things. I even found Pete the Cat fabrics! I also completed my mission of test driving longarmers. There were at least 10 vendors there and I spent time on the Bernina, Block Rockit, Nolting, Tin Lizzie, Avante 18, Innova 18, and the Gammill. The funny thing is that I was headed to the APQS booth when I stopped at the Gammill. My original plan was to skip that booth thinking that they were out of my price range. As I waited for time with the APQS people, I thought I would kill time with the Gammill rep. The test drive was amazing. I mentioned my concern regarding pricing only to find out it was much more reasonable than I ever expected. At the end of the day, I narrowed my choices down to two. I have a lot of things to take into consideration before I finally decide. Then there's the issue as to where to install it. I have two places it could go so I'll have to figure that out. This is such an exciting time! I completed the halloween version of the twister table topper today. I love the whimsical border fabric on this one. The backing is made from fabric that glows in the dark. The skeleton print doesn't exactly match the fabric selections on the front, but that's OK. I just wanted to use the glow-in-the dark stuff! This year's harvest has been overwhelming. I cannot seem to keep up with all the wonderful vegetables. Today I canned pickles. I put them in the crock 5 days ago and could not wait to get to this point. What fun! I used my neighbor's pickle recipe. Every year he brings me a jar of his pickles and they are a family favorite. I mentioned to him that this year I was going to try his recipe. We cut pickle slices and spears and with 50 pickling cukes, ended up with 7 quart jars and 1 pint jar of finished pickles. It was so fun and easy that I think I will make another batch. I certainly wouldn't want to run out over the winter. I completed the fall table topper today. I really love the twister ruler. It makes this wonderful pattern so easy to create. The colors are so very pretty and nice for autumn. I have no plans on displaying this anytime soon. I still want to enjoy summer as long as possible. I finished canning 17 jars of raspberry jam today. Now that I've completed that, I still have to can more tomatoes. I've canned tomatoes twice so far this season and I think I will have to do it one more time. This year's harvest has been amazing. I'm definitely not complaining about all the work. I have pickles fermenting in a crock right now and pretty soon the fall raspberry crop will be ready. For this batch of jam, I used the raspberries I picked in spring. I froze pint sized freezer bags of raspberries which made plenty of jam. I will still have to freeze peppers and corn not to mention getting the pickles canned. I really miss sewing but this sure is a rewarding time in the garden. In a large pitcher, combine wine, strawberries, orange, peach, orange juice, and lemon juice. Refrigerate at least 4 hours or overnight. To serve, pour over ice and top each drink with a splash of club soda. I found some charm packs tucked away in my sewing table and I thought I would dig them out to see if I could use them somewhere. The Vintage Modern charm pack has been in my possession for many years. It sure was time to use it for something. Over the years of purchasing charm packs, it's been my experience that one is not enough. 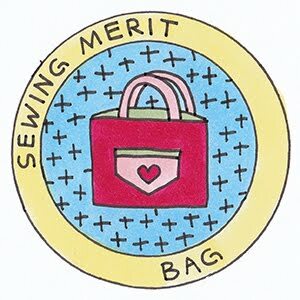 It is a great way to get some variety of fabrics, especially ones you might not consider for purchase but as for actually making something, it's just not enough fabric. I had three different charm packs I wanted to use and since fall is right around the corner, it seems like a good time to use them. So as I contemplated what to do with these single, pretty charm packs, I thought about the twister ruler and what fun I had using one. I borrowed my friend, Sue's to try it out and I liked the results. So when the local quilt shop had the ruler in their clearance section, I snatched it up. The twister ruler and a charm pack was a perfect fit. All you had to do was lay out the 5-inch squares in rows and sew them together. Then add a 3-inch border and start cutting with the special ruler. I remembered the process from using Sue's ruler so I got out my charm packs and sewed the squares together and added the borders. I took my ruler out of the package and realized that I had purchased a different size than the one I used before. The instructions that came with my new ruler stated cut 6 1/2-inch fabric squares and sew them together then add the border. Boy, was I off! I sure thought I had the same size ruler. I had to ask Sue if I could borrow her ruler again since I had already sewn the charm squares together. I got two of the three panels cut and sewn back together and they sure look great. As I look at the Halloween panel, I kind of like it as it is. So I just might leave that one alone. Until I decide it can hang on the design board for now.